I want to encourage all of us to stop simply waiting, and start waiting upon. To start waiting for. Waiting is stationary. Waiting upon is an action. Waiting is staying in the same place. Waiting upon is reaching for more of God. Waiting is a spiritual excuse for inaction. Waiting upon is pressing into God when you don’t know what to do. Waiting implies we sit still. Waiting upon means that we might not physically be moving but spiritually we are drawing closer. Waiting upon God is an action. It is a consistent pressing into the presence of God. It is a determination to set our eyes on the Only One who can give us direction. Stare uncertainty in the face and tell it you know the power of a certain God. God is calling us to action, and oftentimes, we don’t have to wait months to be sure it’s the right thing to do. Take the next step. Move forward. Do what you haven’t done and what you don’t feel you are capable of doing. Trust that He will meet you there. Oftentimes, we need to take a bold step, say yes, and wait upon His goodness as He takes us to a new stage of our lives, instead of putting a decision off and hoping someone does the hard stuff for us. We don’t have to know how He is going to do it. We don’t have to know where and through whom He is going to do it. In fact, we don’t have to be certain about any of the details. We can rest knowing that He will accomplish what He wants to accomplish in us. It doesn’t have to be what we expected, and it probably won’t. It will be so much greater. Why in the world do God’s promises seem to take an awfully long time? In Genesis, God gave Sarah a seemingly impossible promise. He promised her that she would one day have a son. Sarah had a really hard time believing it though. She faltered, she made a big mistake, and she doubted that God would ever come through. Her heart wanted something so badly, and yet God seemed to be taking forever. Isn’t that like all of us? Doubting God will ever come through because we haven’t seen any evidence of the promise yet? His promises are as sure as the trials you are facing. And to Sarah? To Sarah, it seemed impossible. After all, who has a baby when they’re that old? Sarah found it a little hard to believe—she even found it laughable. Sarah, we get you. So many times we read the promises of God and they fall on deaf ears because we’ve dismissed them as impossible for so long. Our broken hearts need God to do the seemingly impossible but we don’t count God as great enough. But in the end, she believed the promise. God brought about what He said He would bring about. He came through for Sarah like He always does, and Sarah learned that oftentimes when God promises to do something, He doesn’t call us to actually do what He himself has promised to do, but to simply believe with fervent, child-like faith that He will do it. Maybe God waits to deliver some promises and blessings and gifts a little longer than we would like, so we can get to know Him in the meantime. Because when we don’t have what we think we want, He can show us that He is really all that we need. If you’re in a place like Sarah, and God’s promises for you seem so distant, trust that He is still at work. That even if you falter along the way, you cannot stop His faithful love from chasing you down and pursuing your messiest broken pieces. An imperfect, messy, mistake-filled kind of belief. A real, gritty faith that faltered sometimes. Sarah is a lot like us. I am so grateful that God always delivers on His promises, even to our imperfect selves. Keep believing and keep pressing on, His promises to You are forever yes and Amen in Jesus. By faith, Sarah herself received power to conceive, even when she was past the age, since she considered him faithful who had promised. Consider Him faithful who has promised. Since I have started my blog, the single most asked question I get through Instagram or email is “how do you study the Bible?” So here it is. It’s nothing fancy or extravagant. I’ll share with you some of the tools I use and others I find helpful. First-let’s get real. Life gets busy and sometimes quiet time can tend to slide to the back burner. I have found, however, that when I schedule my day around my time with The Lord, no matter how busy I may be, instead of scheduling my time with the Lord around my day, I find myself refreshed, renewed, and strengthened. Let’s also be real about what it all looks like. My quiet time isn’t typically perfectly pictured with coffee and a journal and the lighting looking just right. No, most mornings I’m in my closet with verses taped on the walls studying in there with absolutely nothing to distract me because I’m like a little kid-if I don’t eliminate every distraction I don’t get anywhere. Pretty Instagram and blog pictures are great and all but the real stuff looks a little different. All I can accomplish in one day doesn’t compare to time spent with my King, because it’s in that time that I find the strength to live each day. He’s the one who has given every breath, and I have found that giving back the first part of my day draws me closer to Him and sets my heart straight. Your mind might be more focused at night, or in the middle of the day, find the time where you can give The Lord as much of your attention and focus and energy as possible-bring Him the best part of your day. It’s not a chore-it’s an incredible privilege. When you start to see it as the best part of your day, His Word comes alive in new ways. This world isn’t easy on you and it isn’t easy to get through a single day without being distracted about 500 times. So fix it in your mind that no matter how small the amount of time may be, spend it with Him. It may be five minutes, or fifty, but it all matters. Don’t let your enemy convince you that because you can’t sit down and spend an hour in the Word, you shouldn’t spend ten minutes. Quality matters over quantity. There isn’t a time of day that’s “right.” There isn’t an exact plan that is universal and should always be followed. But there is room for grace, and God sees our small little attempts to get to know Him and blesses them. Come running to Him every. single. day. Even if it’s a childlike crawling to His feet for a few minutes-don’t let one day pass that you don’t come to Him to find the sustaining power you need. So join me today as I walk you through what my mornings look like. Yours may be entirely different-and that’s ok-we’re pressing on to know the same King, but our journeys will look different. The first thing I do when I open the Word to study is pray. Typically my Bible study in the morning involves praying through the Word. I’ve found for me that I need to audibly “preach” to myself in the mornings–that’s why I spend them in my closet. It has to be just me and the Lord so I can talk to Him out loud. You might find you write your prayers better, or that the quiet front porch where you can just be silent is the spot for you. Find that spot. Find what works–and then pursue Him like crazy. I learned a little acronym from one of John Piper’s book, “IOUS,” that has stuck with me and I usually find myself praying through it as I begin to open the Word. I-Incline my heart to long for you, Lord. Give me a desire to know you more and to make your name known. O-Open. Lord God open my eyes to behold your Word! Open my eyes to see new things and to learn new truths. U-Unite. Unite my heart to fear your name. 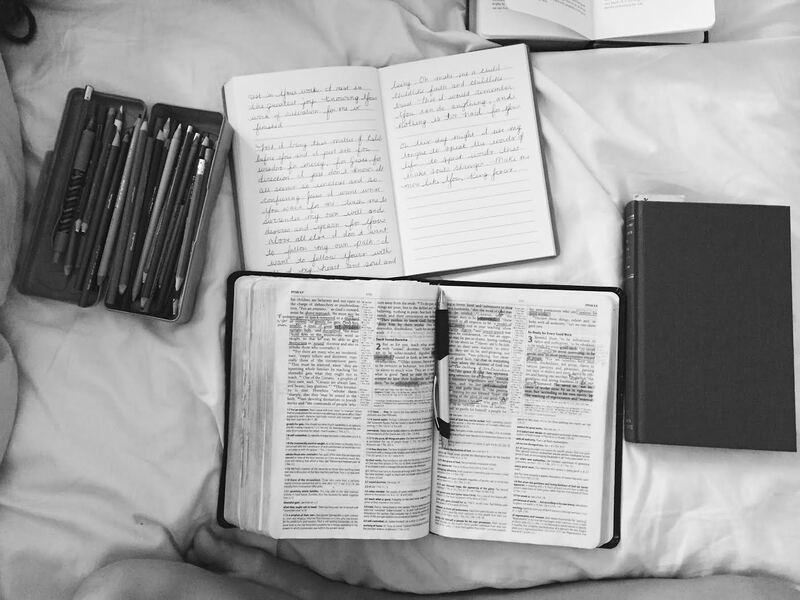 Join my mind to my body so that I would live out the Word that I study today. S-Satisfy. Oh Lord satisfy my heart in you alone! Not in anything this world has to offer, but in your truth and by your Holy Spirit, through your Word today. Then I read through a passage and typically go verse by verse. Lately I’ve been studying Hosea using a study by Kristin Schmucker. What I love about this study is that it offers some commentary while also allowing you to soak up the Word and study it for yourself. In a passage I’m going through, I’ll typically pick a few verses that stand out to me and write them in my “Be Still” journal-another great tool from Kristin Schmucker. I’ll go through those few verses and paraphrase what the author is saying and how the Holy Spirit is speaking through them. Next I’ll look up cross references for these passages. Often times this leads me to many other verses that are related. If you don’t have a study Bible a concordance is also great for this. Ask yourself questions about the setting of the passage. Look for and pick out similarities between the people in the story and yourself. Identify with them. Don’t rush through it. Soak it in. Put yourself in their shoes and walk through the journey with them. Then ask the Lord how he would have you apply this to your life. Don’t end your time with Him without learning one thing you can carry with you through the day. It’s not fancy. It’s just a verse-by-verse walk through, writing down things that stick out to me and truths I want to press into my heart. Ask the Holy Spirit to be your guide and rely on Him. I truly believe He meets our weakness in an incredibly unique way when we open the Word. This book will shake you from the first pages. It’s one of those books where once you finish, you just want to start it again. Goff opens your eyes to see how God calls us to live out our faith in love. His faith will inspire you and completely change the way you look at love. Love does, it doesn’t just talk-or as Goff says, “love is never stationary.” This book will make you want to adventure outside of your comfort zone and take risks in the name of love. I dare you not to be changed after reading it, and I dare you not to want to read it again. I can’t say enough about how this book will give you an entirely renewed perspective on what really matters and the urgency of living for God alone. It will root in you a healthy fear of wasting your life. Piper offers an alternative to spending our days for selfish gain, and shares his own story of seeking to treasure Christ. His faith will encourage you in your own walk, and remind you that there is so much more to life than what this world offers. purchase here or enter to win this book by heading over to my instagram (giveaway rules will be posted Wednesday, July 27th at 6pm EST)! Wow, so many emotions come back when just writing about this book. As cliche as it sounds, this book of all books changed my life. I’m not really sure when and where the fear crept in, but I lived most of my life paralyzed by what other people thought of me, and wallowing in the lie that I was not enough. I might not have admitted it, but I had convinced my heart I was inferior, and didn’t have what it takes. Beth Moore’s words painfully pried that fear out of me. First, my eyes were opened to see that insecurity was in fact what I was struggling with. Then the book guided me through those feelings and bringing them to the foot of the cross. I still struggle with insecurity, but now I call it out and identify believing it as sin. A truly incredible read everyone should read. Talk about altering your view of prayer! This book is powerful stuff. Priscilla dives into 10 different areas where we face attacks from our enemy and encourages you to develop prayer strategies to combat these attacks. The book comes with prayer cards you can fill out and write your strategies on. Our enemy might be disarmed, but he’s still pretty smart. Unless we are constantly going to war in our prayer life, we will continue struggle with an onslaught of his attacks. This book reminded me of the power of prayer and gave me practical advice for ways to implement a prayer strategy. I don’t know what really inspired my 15 year old self to open up a deeply theological book, but I know it changed me. This book showed me the urgency of living out the Gospel. It instilled in me a healthy fear of the bleakness of eternity without God. It made me weep for the hearts who don’t know my King. It’s a powerful book that takes some work and time to read through, but it’s worth it. It might have been written in a different century, it might be “old-school”, but it’s a beautifully challenging book. These are five of my favorites. I’m always looking for new reads so leave yours in the comments! We’re all running around in circles chasing these silly little pursuits and I can imagine God just shaking His head and laughing a little. Laughing at how slow it takes us to learn. Chuckling a little at our stubborn hearts that think they know best. He knows our hearts are so prone to wander into lukewarm faith and watered-down desires. He knows we get so easily fooled into thinking the world will deliver on its promises, and He knows there is more for us. Our incredible God-He knows what He made us for. He made us to chase Him with every fiber of our being, drawing in the lost by the beautiful display of the Gospel that our lives become. & yet we would rather chase boys, applause, and attention. We would rather chase acceptance, approval, and praise. We would rather chase money, position, and a career. Our God knows all this. He knows that the American lie has convinced us that we can have both Jesus and the world. That we can live on the fence and we’ll be satisfied. That we can wrap up all our worth in man’s approval and yet experience the full joy of the Lord. That we can walk with the foolish and somehow become wise. That we can serve both God and money. He knows all these lies we’ve been fed and let ourselves believe. Yes, He knows all of this. The struggles of our hearts in toying with the things of the world. The silly little pleasures we run after. He knows the time we’ve wasted on things that pull us away from Him, and in His perfect goodness He offers to us a beautiful promise that He delivers on. I think He wants us to remember that there is a whole lot more than what we see. That His glorious purpose for the world involves you, but it does not revolve around you. We need to spend time with our God not necessarily so that He can show us what the big picture is-but so that we can simply be reminded that there is one. That there is more, greater, deeper hope than all this world has to offer. That our time here on this earth is very small compared to eternity, but incredibly important in light of eternity. That there is more than just me. There is more than my little world and what I want, there is a hurting, dying, world out there in desperate need of a word of grace. There are hearts looking for an answer. This life is so much bigger than what I want. It is so much bigger than simply my dreams-there are God sized dreams just waiting to be unfurled if I would lay my own down. All those desires we have, all those things we are chasing, it’s not too much. It’s too little. We need to lift our hearts higher and chase what really matters. Let’s chase the One we were made to live for and glorify and reflect. Your desires for “more”-that emptiness you feel when you chase the world-all that is pointing to something greater. So chase Him. Lay down your pursuits for joy in the things of the world and put all your stock in Christ. There is an abundance of joy, peace, and perfect contentment He is waiting to pour out if we would come. Come, chase Christ with me. Let’s forget the lesser loves. I am so thankful I found this podcast. It changed the way I view work and challenged me to minister and grow right where I am. Jonathan challenges the way we look at our “passions” and offers us a better way. I love it. I found this especially encouraging as a student. No matter where God has you right now, stop looking to where you think you should be and start embracing the sphere you are in. We get so caught up in pursuing a career and building our resumes, but God wants us to go deeper. We’re working to display Him. We’re working to make His name famous. Work hard, because work is hard. Love people and minister right where He has you. Make His Name famous. Don’t follow your passion. Follow His passion. We hear it all the time, “Follow your passions.” So many of us have taken this advice, moving from job to job. That’s what the world says, when really God has you in a job right where He wants you. Luke 5 shows us how Jesus used Peter’s job as a fisherman to bring Him glory. We have to change our perspective, invite God in at work (He wants to go with us), and pursue greater passions — God’s passions. Then we’ll really be on our way to adulting! our hearts are all searching. we’re all seeking something. whether it be fame, wealth, popularity, or the presence of Jesus Christ and eternal joy in Him. our hearts were so designed that we’re longing for something. this past week I had the opportunity to hear one of the humblest, clearest, men of God preach. my heart is yearning for more to know the glory of the hope of Jesus Christ and so I’ve come to share what made such an impact on me. the questions that we all ask at some point during our lives. we may not ask them in this order–we may not even realize we’re asking them, but all of us will. How can what is wrong be made right? there are two worldviews. there are two ways to answer this question. there is a white, and there is a black. the culture//non-Christian worldview has their answers. and the Christian worldview has its answers. Who am I? I am the result of random evolutionary processes. I’m an accident. Why am I here? I am here to consume and enjoy. What’s wrong? People are either insufficiently educated or insufficiently governed…or insufficiently medicated. How is what is wrong made right? Violence: anger management class—or you need to be governed or medicated. We need more meds, more education, and stronger, more sufficient government. All of this will lead us to “utopia.” It doesn’t satisfy. You know it-I know it. The culture tells children we are here because of an accident. Educate better, medicate better, govern better. But things continue to get worse. It doesn’t satisfy and it doesn’t ring true. You’re still left searching for an answer. If we’re all the result of random evolutionary processes the only right thing is to take what you want from those who have it. If we’re here to consume and enjoy—what else is left to do? What happens when you educate a violent person? You get a more sophisticated violent person. Who is gonna govern the governors? The culture’s answers are not ok. The world is not ok. Those who hear it—are not ok.
Who am I? The world says you are an evolutionary accident—and the Word of God says: I am the crown and glory of the Creation of God. The culture wants the results from our worldview while rejecting what accomplishes it. We are the crown and glory of the creation of God. Every soul has value and purpose and beauty and glorious worth. Because every soul is crafted by the one who breathed the stars into existence. Why am I here? I was created to bring glory and honor to God my Creator. We live to the glory of God—and govern the things and ways we enjoy/consume things. The only way to get to conservation is through worship. The culture says we ought to worship the creation—we get there by worshiping the Creator who made us stewards over the creation. There is purpose and joy and hope here and now because of Christ. There is an eternal hope to which we are reaching. Oh, praise Jesus, this is glorious. What’s wrong with the world? You. “Who once were alienated and hostile in mind and doing evil deeds” (Colossians 1:21). I don’t do what I was created to do. And instead of bringing glory to God I’m hostile to Him. In short, what’s wrong with the world is sin. Our culture doesn’t like this category. We attempt to preach the Gospel without preaching about sin. The culture looks out and sees the problems—“we need to get them into the right environment.” What is wrong? Sin. You can’t look outside of yourself to find the problem. It can’t be educated, governed, or medicated out of you. Your problem is sin. I am at the problem with the world. How can what is wrong be made right? The Cross. Oh the glory and hope in that ever profound and awful deed. We have no hope unless someone can come from outside of this world and rescue us. God made Him who knew no sin to become sin for us. He is our only hope. Our only hope is that we are reconciled to God by the blood of Christ. Christ was born without sin and lived without sin—His active obedience—He is born perfectly righteous and in his active obedience he achieves perfect righteousness. If I am going to stand before God—alien righteousness has to be imputed to me. This is why all the Gospel matters, and the virgin birth matters. Because in all my wickedness Christ looked upon me and set his love on me. Not because of anything I have done–or ever will do. But because of the indelible riches of his grace. And it’s the only one that satisfies. There is not a greater answer we could come up with by philosophy. There is not a greater hope. The Word of God is inerrant, infallible, and it is sufficient to answer the questions of those who don’t even believe it. The only way you can have your best life now is if you’re going to hell when you die. You can have utopia You can have your “best life now.” I’ll take glory. And I’ll enter there not by my own works-but by his work. Because there is nothing that this world is offering or proclaiming that comes close to that. Flee from trusting in yourself and flee to Christ. Live the rest of your life with the anxious anticipation that you will be presented before the Father by Jesus Christ–spotless, blameless, wholly His. Made worthy by his call.